Are you confused in choosing between Canon Powershot D30 and Nikon Coolpix AW130? In a prior article, we have ever discussed the comparisons between Canon Powershot D30 and Nikon Coolpix AW120. This time, we are going to bring the sibling, Nikon Coolpix AW130, into the battle. 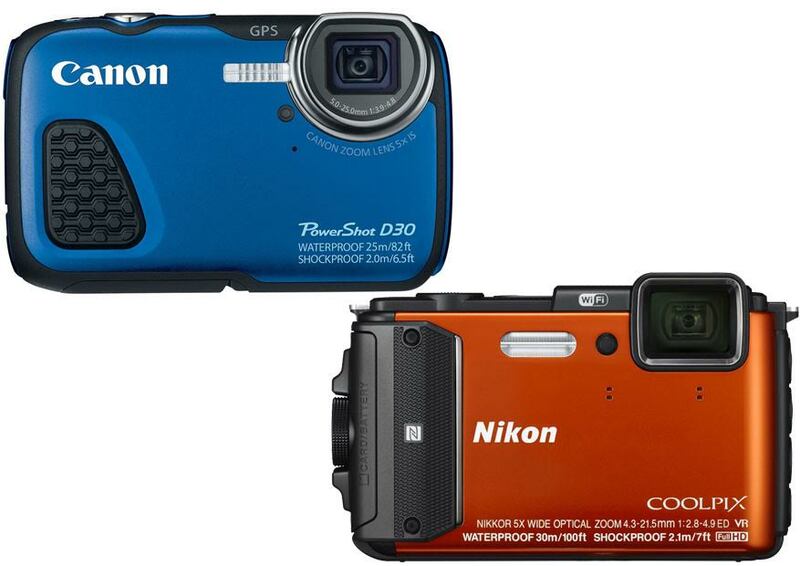 These two models are compact digital cameras with highly rugged and durable housing. They are available under three hundred bucks each, though Canon Powershot D30 may require more of your money than Nikon Coolpix AW130. So, what’s the difference between these Nikon and Canon models, and which is the rugged digital camera that you better choose? Both models have been weather-sealed. They can endure usage under rain and receive some splashes without damage. In fact, both models are also freeze-proof and shockproof, meaning that they have outstanding durability regardless of the conditions of the environment. Canon Powershot D30 deserves some praise due to the smartly placed textured rubber grips on the front and rear sides where the fingers usually hold the camera. These rubber grips ensure that the camera will not accidentally slip off from your hand. Canon Powershot D30 is equipped with a 3” fixed display screen with button control. Take a look: Canon PowerShot D30 vs. Olympus TG 860. Nikon Coolpix AW130 actually looks very cool and elegant, but the lack of textured surface makes this camera prone to slipping, especially when your hands are wet. Nikon Coolpix AW130 also works with buttons and dials for control, but the 3” fixed display screen has a much higher resolution. While Canon Powershot D30 is lacking in features, Nikon Coolpix AW130 prevails. The Nikon Camera has been armed with a 16 MP 1/2.3” CMOS sensor, in contrast with Canon Powershot D30’s 12 MP BSI CMOS sensor. Well, the Nikon camera is able to capture larger and more detailed images, but the Canon camera may have better low-light performance due to the back-illuminated sensor. Nikon Coolpix AW130 has higher maximum ISO and shutter speed, which are very useful for better adaptability to challenging conditions. The continuous shooting speed is also much better. Plus, there is a time-lapse recording function. Finally, Nikon Coolpix AW130 is coming with built-in Wi-Fi, which enables you to easily share pictures and videos. But that’s not the sole function – you can also control the camera remotely using your smartphone, via Wi-Fi. In the end, we advise you to choose Nikon Coolpix AW130. It has a lot more useful features and better image quality.